Rava dosa is an emergency breakfast recipe. When you have run out of dosa/idly batter and no other tiffin is preferred at home, this recipe will come in handy. Some of my friends have told that making rava dosa is difficult. 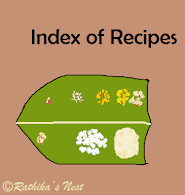 In fact, rava dosa can be prepared easily if you follow some simple rules. Here is the step by step recipe. Note: The ingredients mentioned here make approximately 8 dosas. However, the number of dosas depends on the size of the dosa tava you use and the size of the dosa you make. Method: Mix rava, rice flour, maida and salt in a bowl with buttermilk and two tumblers (400ml) of water. Use a hand blender and mix very well taking care that lumps are not formed. Add pepper, jeera, green chillies and ginger to the batter. Mix well. The batter should be thin and of pouring consistency. If it is very thin, you will find it difficult to make dosas. On the contrary, if it is thick the dosa will not taste good. See the picture showing the right cinsistancy. Allow the batter to stand for 30 minutes. How to prepare dosas: Heat the dosa tava very well. Though you can make rava dosa on any tava, it is preferable to use a flat tava. You need to make rava dosa on high flame. Mix the batter well before using. Once the tava is hot, take one big hollow ladleful of batter and start pouring along the edge of the tava. You may alternatively use a katori or a teacup for pouring batter. As the batter is thin, it runs towards the center. You may lift the tava by the handle and tilt it gently to let the batter fill the gaps, if any. Please note that as the batter spreads there will be small gaps in the dosa as shown in the picture. Leave it as such. DO NOT TRY TO SPREAD THE BATTER USING THE LADLE, as you would do with ground dosa batter. Pour a teaspoon of oil around the dosa. Allow it to cook till the dosa turns golden brown. Remove from fire. You NEED NOT turn the dosa and cook the other side.Serve hot with chutney and sambar. Note: You may avoid pepper and green chilli in the recipe, especially if you are making dosas for children.